Presenting a 17th century wool tapestry fragment from Brussels featuring a central blue man, a symbol of rebirth or "renaissance", representing the cycle of growth each spring. Surrounded by birds and foliage with a border fo flowers and twining ribbons. Edged with antique gold metallic trim with scalloped edge, set to a modern ocean blue silk velvet on both front and back. Finished with a tiny gold metallic eyelash fringe around pillow. Pillow has "butterfly" corners. 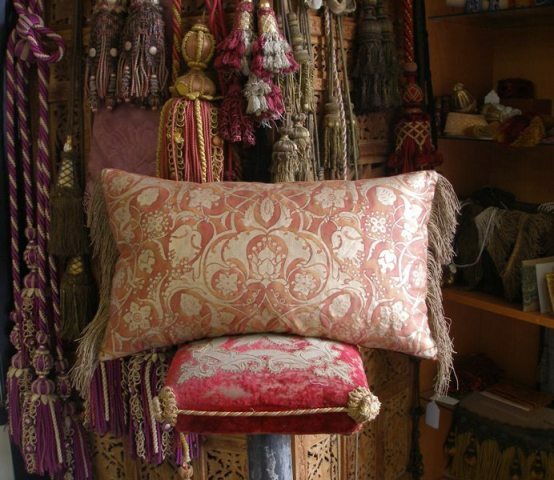 Presenting a pillow made from 1920's vintage Fortuny. Dandolo pattern, an 18th C. Italian Design named for famous Venetian Doge. Raspberry colored ground with golden toned parchment overlay. Finished with vintage gold metallic cording. Two antique tassles adorn the upper corners, three wooden forms in graduating sizes wrapped with gold silk and gold metallic threads that have aged to a gunmetal color. Back is modern gold silk v elvet. 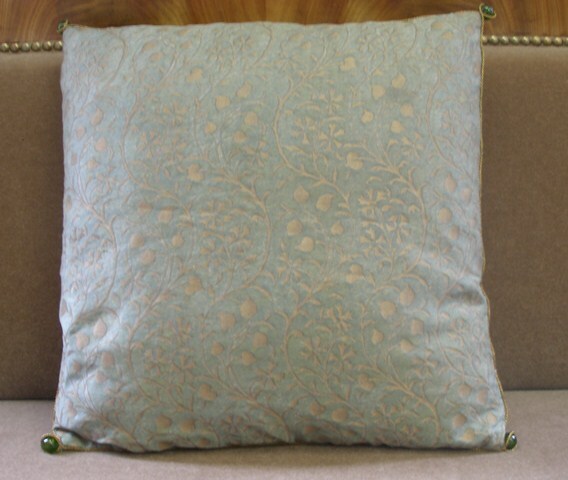 Presenting a vintage 1950's Fortuny fabric pillow. Pattern is Granada modern Spanish design named after Fortuny's birth place. Color is a blue green with silvery gold metallic overlay. Back is modern gold silk with green highlights. Finished with tiny gold metallic cording and Venetian Murano glass beads in each corner. 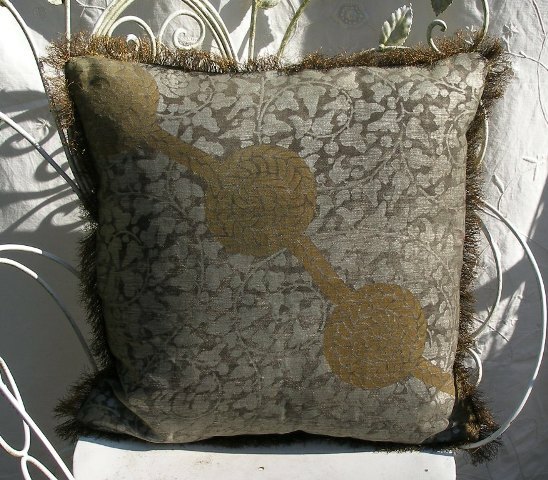 This is an original Fortuny Pillow made by the same workshop that made Fortuny Dresses from the remnants. The backing is the same lining used in the clothing line for gowns. Original label on the back . The form is newly added. Fortuny used two methods for stenciling gilt metallic finishes to velvet. Gauffered which has a raised or relief effect and flattened finish which leaves the velvet pile flattened where stenciled. This is the later. Coral or Salmon colored velvet with silver metallic gauffered overlay. 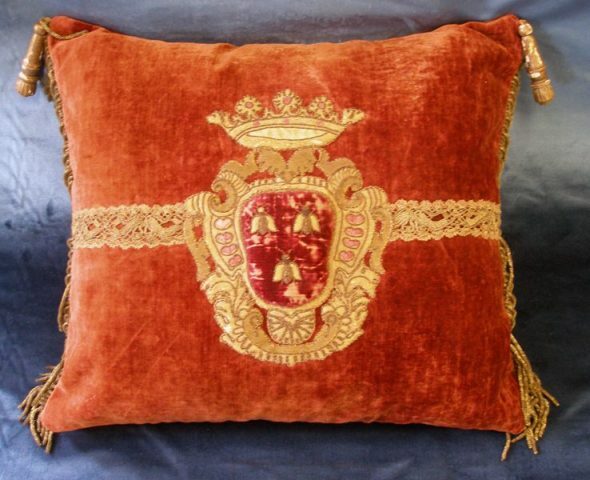 18th Century Italian Coat of Arms Pillow. This coat of arms is possibly for Pope Urbanus VIII. Ornate crest thickly padded, shield with three bees facing up, embroidered in gold metallic threads on red silk velvet ground, mounted to antique velvet with 18th century trims, thick bullion fringe and gilt wood tassels at the top corners. Wear appropriate with age. 23" tall by 23" wide. One pair of pillows in Fortuny's Persepolis pattern, 16th century Tulip Motif. In 2005 Fortuny Inc. brought back several old patterns, this is from the Cantina color collection. Color way is copper with Silvery gold metallic overlay. Sides are finished with 19th c. gold metallic fringe. Back is modern copper brown silk velvet. 13" tall by 22" wide. Face: 19th century French raised metal and silk embroidery work on it's original green silk velvet. A centered cartouche with flowers surrounded by a symmetrical thick floral design. Backed with an antique silk velvet, edged with an ornate double twisted antique metal cord. Face:1920's Vintage Fortuny Pillow Clamys pattern, Charcoal ground with both gold & silver metallic overlay. Seta & Oro. Silver swirling vines with leaves and knots in gold metallic overlay. Antique gold metallic eyelash fringe trim around perimeter. Backed in bronze silk velvet. Size 20" square. Face: Fortuny Nicolo in blue with silvery gold overlay (the only color way currently available). These two pillows are made from new Fortuny, a pattern I am thrilled they have brought back into production. Fortuny's Pomegranate design inspired by Italian fifteenth century fabric. Back Pale Silver Silk by Jim Thompson Details: 21" wide by 14" tall with 1 1/2" matching flange border, finished dimensions 24" wide by 17" tall. Face: 16th - 17th century Italian silk brocade with gold metallic floral pattern now aged to silver. Bordered with 19th century silver flat trim and ornate silver metal lace & sequin trim. Raspberry colored silk velvet on either side edged with 18th century silver metal fringe. with tiny silver metal bobbles. Back matching silk. 1920's Fortuny Corone pattern. 17th C. Italian Design - Crown motif. Fairly rare color way, produced by Soc. An. Fortuny during Mariano's life time. Blush colored background with parchment overlay. Back of pillow has matching silk velvet. Finished with vintage gold metallic soutach trim, knotted at corners. Face: Late 19th century Gold Metallic Brocade Face, pieced with gold metallic vestment trim featuring tiny daisies. Sides edged with antique gold metallic eyelash fringe. 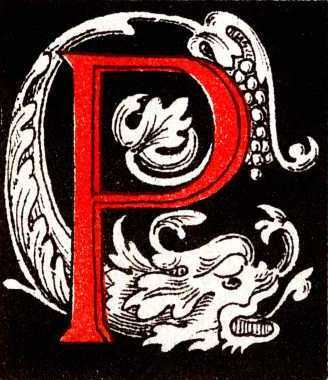 One version of pomegranate design inspired by Italian fifteenth century fabric. metallic fringe and scalloped galon trim. 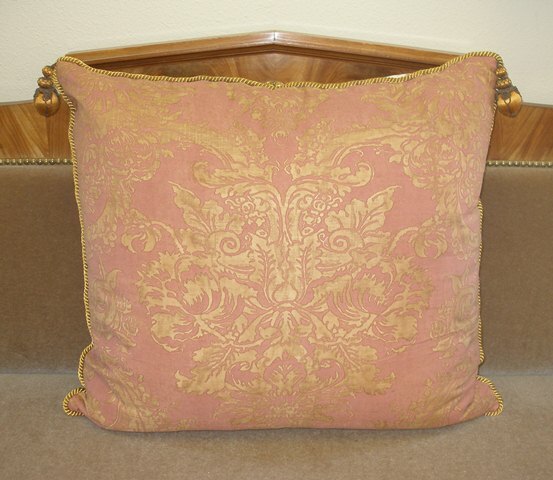 Face: Center of pillow turn of the century velvet panel bordered with antique metallic trims in gold & copper threads. Sides edged in antique gold metallic eyelash fringe interspersed with caterpillar coils (torsades) . Side" Butterfly Pleat corners, seams finished with unusual 19 th c gold metallic Galon trim with stylized scrolling leaf pattern. Back is modern mohair velvet in dark bronze color.